I can hardly believe the baby is already almost 1. In just a few short days, we'll be celebrating his first birthday. It blows my mind that just a year ago, I was wondering when he might show up, busily getting things ready for his arrival and timing bouts of contractions that felt like they'd never lead to his birth. Here he is though, Mr. Mischief himself. He's a walking, gibberish babbling jokester who likes to make us all laugh, barks incomprehensible orders at us, gives great hugs and kisses, loves to wrestle with his daddy and big brother and always has a glimmer in his big brown eyes suggesting he's plotting major mischief. We aren't going to have a big party but that doesn't mean I haven't been busy dreaming and scheming for his celebration. As I started to envision his first birthday party, I turned to Pinterest for inspiration. 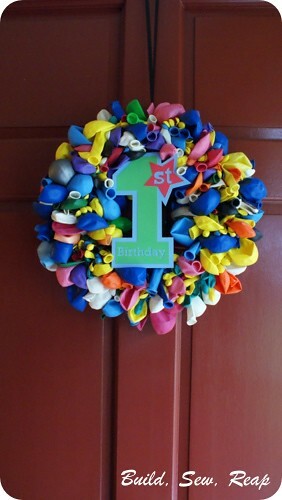 I kept coming across balloon wreaths and just loved them so I set out to make one myself. 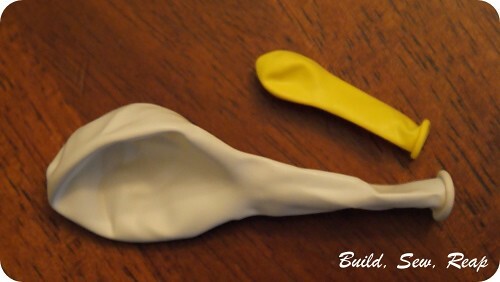 It was really easy so first I'm going to show you how mine turned out then I'll walk you through some tips on making your own. Here are the balloons I used. These were great. I could see that some had holes and many were of questionable quality but since I wasn't blowing them up, my $1 per bag was well spent. There are several sizes of balloons in the bag but I just broke them into 2 piles, tiny and not tiny. Here's a picture of the tiny one and the next size up. The tiny ones are clearly quite tiny. Start with the not tiny pile. 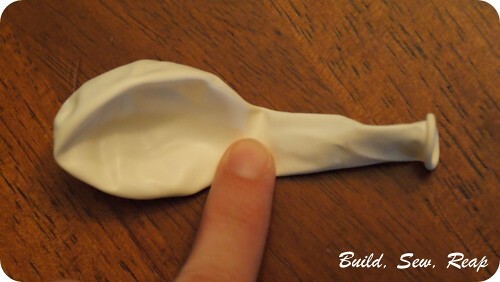 Fold a balloon at about where the round part meets the neck. 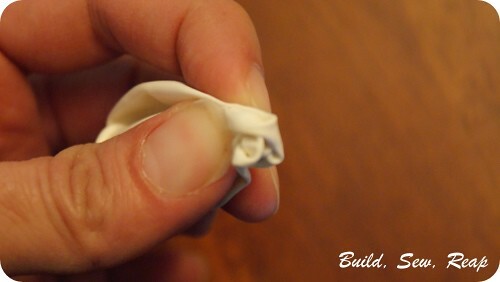 Squish it and add a glob of hot glue to the end. 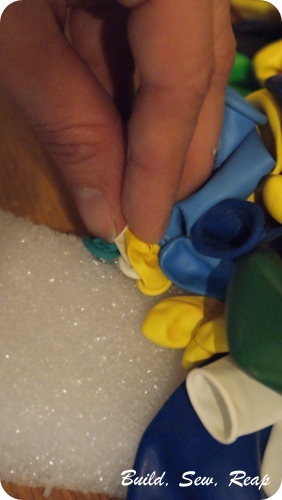 Stick it down to the styrofoam then do the same for a bunch more. 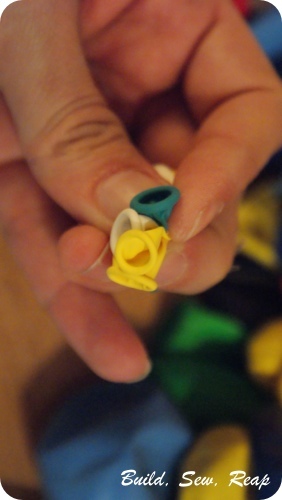 I put them close together but not so tight that I couldn't tuck bundles of small balloons in between them later. Which brings me to how to stick down the little balloons. Glob them all with hot glue. Now stick them down in between the bigger balloons (or at the edge ... it was easier to get a clear picture if I stuck them next to the bigger balloons than within them). I worked my way around the styrofoam, periodically stopping to allow the glue to cool and set so I didn't mess up completed sections. 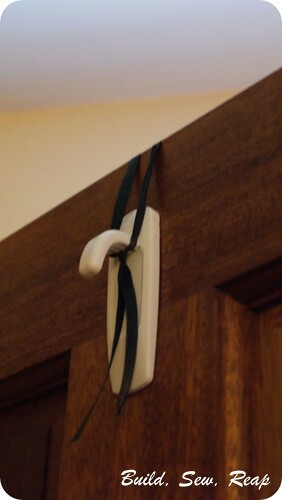 Before I got all the way around, I tied a black ribbon around the styrofoam so I could hang the wreath on the door. I covered that ribbon with balloons as I didn't want it to be part of the design at all. That reminds me, if you stick a wreath hook on the BACK of your door, upside down, you can run a ribbon from any wreath over the top of the door to hold your wreaths. I love that when I don't have a wreath up, this hook isn't staring at me from the front of the door. So, here it is one last time. I added the "1st Birthday" cutout that I made using my Silhouette. 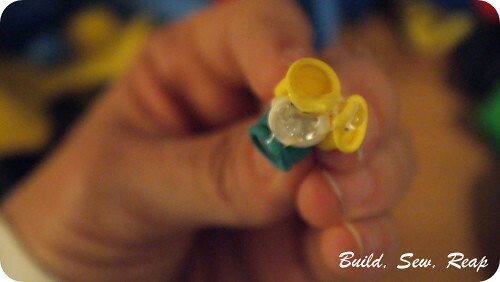 It was the "Baby first birthday card - title- tag set" by Alaa' Studio. I taped it on so I can easily remove it after the party and save the wreath for future birthdays. 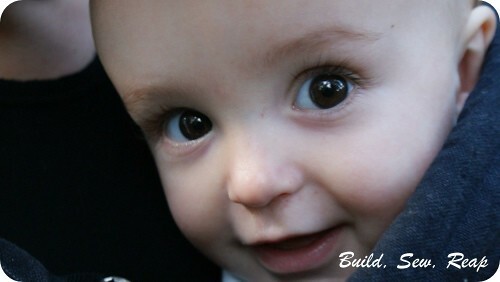 Nice to read your article!I appreciate your guidelines for baby Safety. It’s nice information for us. Safety is very important for all sides. Full information can be helpful for all. Thanks for giving some important information about safety. 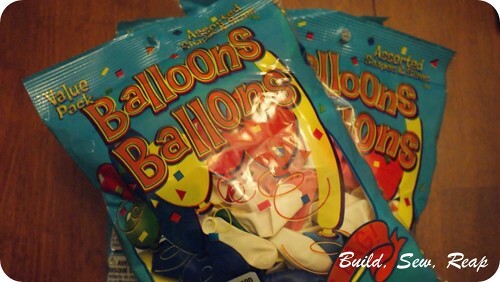 Here are the balloons I used. These were great. I could see that some had holes and many were of questionable quality but since I wasn't blowing them up, my $1 per bag was well spent. This is really awesome. That reminds me, if you stick a wreath hook on the BACK of your door, upside down, you can run a ribbon from any wreath over the top of the door to hold your wreaths. Everything I've read, is quite clear and easy to understand. But I regretted one thing, you describe it less logical. Maybe for others it is quite easy, for me this complex. Hopefully in the future you can write better.